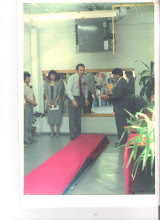 "square form is the first form i learnt in Tai Chi. It brings back many memories although with my current understanding, i believe the square form may block the learning of the transitions, which are essential if we were to apply Tai Chi. But i do understand where you're coming from." Compact square form practice has other roles which do not concern itself with transition . The major reasoning behind Compact square form has to do with teaching the student how to delineate yin and yang in the body. That is to teach the student how to hold one part of the body still while the other part moves. As we have said in this article and others, the exraneous motion of arms and legs is another word for nerve signals along the path of qi. A minor role of Compact Square form in part has to do with movements that call for steadying arms and hands that are so subject to localized nerve impulses. Indicative of localized nerve impulses is the natural and easier tendency of students to move extraneously from the arms, shoulders and push from the legs. This easier tendency fits nicely within the domain of large frame Tai Chi with its external motions, but it is still not internal. Qi of course traverses the torso as well as the arms and legs. With internal motion where the yin/yang junction is located in the torso, where there is no attendant motion at the joints of the body, the qi will traverse the body unimpeded. With external motion the qi will be impeded at the localized yin yang junctions of the shoulders, elbows, knees, hips, etc. Practicing transition with transition in mind is a minor task of Compact Frame round form. The major role is to develop internal energy in the practitioner. Only when external movements are truly minimized as in Compact Frame round form can internal movement flourish. Then and only then will such playing of the form will result in seamless transitions. This is because the internal energy is circulating in the body in a continuous manner without any break. Certainly Tai Chi form movements along with the transitions between them make more sense if they are corroborated with martial art origin of the movements. The student understands why there are such sequence, transition and the meaning of why the body has to be concerned with positioning and impeccable timing. Further study of transition, positioning and timing can then be relegated to push hands and sparring exercises. Once internal energy is attained throughout the body however, there is not the concern with transition that accompanies Large Frame because in Compact Frame the energy is circulating continuously . Where then is any seam for an opponent to attack? This is a day and age of immediate gratification, immediate communication, etc., but it is there any argument that people are stressed out? Is there any doubt that this may be due in part to human nervous systems being in a constant state of stimulation and over-drive? Tai Chi and its attendant reputation as a stress reliever seems tailor made for over wrought nervous systems. Yet, because of the yen for immediate gratification, Tai Chi has fallen victim to much of the hype. Tai Chi has a worldwide reputation for slow movement, almost as if practitioners are not even moving at all. What is there in this, that does not appeal to those who are seeking serenity, some respite from the frenetic malaise of modern life? There is a famous saying in the Tai Chi Classics called: "Seek the stillness in movement" and it is attributed to the very popular Yang Cheng Fu. Stories of Yang seem to indicate that he did not want to study Tai Chi early on, there is every indication that he was largely self-taught. Unlike his brothers who submitted without question to the rigor of their father's training, one wonders at how rigorous his training actually was. Nevertheless, the advice is well taken. However, I would re-phrase this to say: "Even if you cannot achieve it, at least understand the rationale of stillness in stillness, then one can seek the stillness in movement". In other words, if a student cannot stand still, much less understand the reasons when a situation calls for standing still, how then can they be expected to achieve stillness when they are moving? Is it any wonder that the first lesson of any military organization is to teach recruits how to stand at "ATTENTION". Every Marine recruit (and I was no exception) hears that word spoken very loudly on a consistent basis, and they learn early on to bring the body to total immobility. No one dares to instinctively scratch an itch, make "extraneous movement", etc. and failure to retain "attention" results in immediate retribution. "if a student cannot stand still when a situation calls for standing still, how then can they be expected to achieve stillness when they are moving?" This should be the easiest part of the training for students, after all they are not required to make any complex movements...just to stand still and watch. Yet, it seems to be the most difficult, the nervous system seems like it is firing non-stop and the student simply cannot quiet their movement down. To further make my point about the importance of this training in Tai Chi, notice the extraneous movements of the arms and hand fluorishes during the performance of the Wu Style Form in the Facebook article. The challenge for both teacher and student is how to train the Yin, how to reach stillness in movement. As Master Hwa says: "keep parts of the body still when they are not required to move". This is perfect rationale for teaching the Square Form to students before Round Form. Square Form is essential in so many ways, but to curb the instinctive movements that students make, it is most often a necessity. The Yin aspect is that part of the training wherein the student is taught to keep one part of their body still while the other part moves. Learning to keep one part still while the other moves, to delineate what is yin and what is yang is the most important lesson Wu Chien Chuan passed on to Young Wabu (Master Stephen Hwa's teacher). What can be done: Students want to learn fast and that is part of the "immediate gratification" problem. There is so much, so rich of a bounty in Classical Tai Chi wherein a student can take steps to curb the natural inclination of the body to those instinctual but extraneous movements. First of all, like any college course that requires textbooks, the learning of Classical Tai Chi Square Form is more than enhanced by the acquisition of video. With even one lesson per week, having a DVD becomes like having the teacher for oneself...like the old days of apprenticeship in Tai Chi. Regarding the learning of square form, making a straight line in one's movement whether learning to write or learn Tai Chi is certainly easier than learning to make curves. This is particularly in light of the frenetic and persistent problems we have spoken of regarding the nervous system. Instinctive and extraneous nervous system glitches on the part of the student are no problem for the square form. For one, it avoids the use of internal discipline in the upper body, saving that for offline silk reeling practice. As well, the basic walking practice (really a "square form practice") allows the upper body to remain immobile, no hand movement required. And the list goes on. I would urge all students and interested parties at the very least to obtain the book "Uncovering the Treasure" by Stephen Hwa, where this is discussed in detail. Then, I cannot recommend enough that students take pains to eventually obtain the "textbooks" (DVD's) for their studies as we have iterated. I practice and teach a Compact Square Form in addition to Compact Round Form. 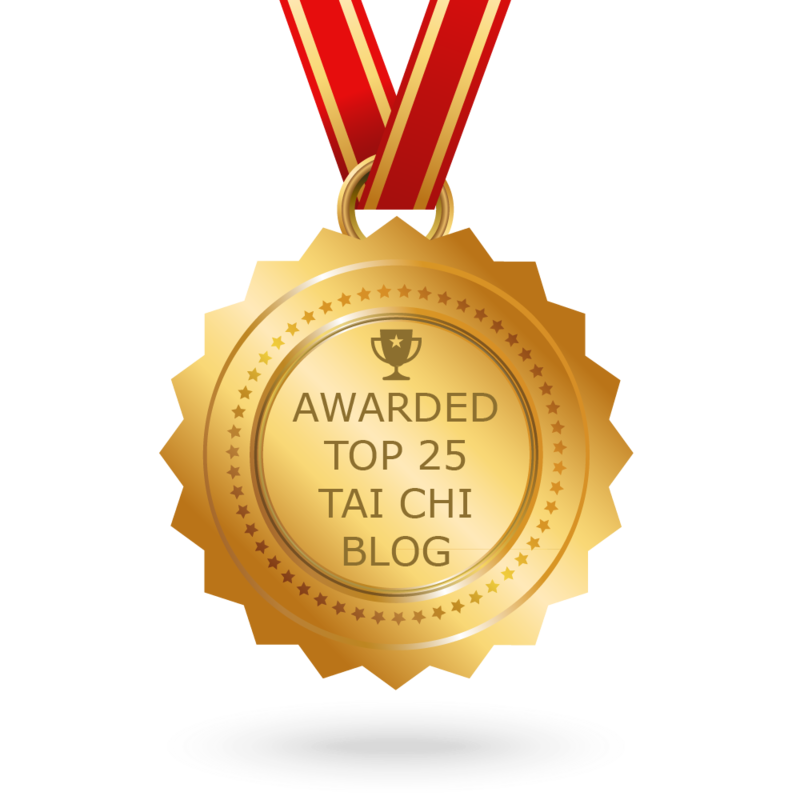 Specifically, this is directed to the authors of the blog article "Robot Tai Chi by Stephen Hwa" and generally to interested readers who may or may not practice the Square Form of Classical Tai Chi. Generally, one must assume that not many people are familiar with the Square ("Fang") Form. To my knowledge it came to fruition during the 20th century. It arose as inception and development by the Wu Family Tai Chi and its representatives. In its various incarnations and variations it has been introduced and taught by disciples and family of Wu Chien Chuan. What is not agreed upon even among the family and representatives is which version is correct. To explain this I can only offer that there is very obvious difference between large frame square form and compact frame square form...size difference. In regard to the "Robot" portrayal: I have for some time now not concurred with any representation, narrative or designation that fails to accurately explain the rationale of any Tai Chi movements to students. It would be injudicious to assume a priori that a robot's Tai Chi could be any less or more correct than a human's. Particularly because the majority of Tai Chi that is taught nowdays is not correct to begin with. The reason for this is simply because it demonstrates time and again that it deviates from its origins and roots. I have seen it time and again over 30 years that Tai Chi forms become watered down if not passed on intact from one generation to the next. The Square form insures that there is no deviation in this process, no moves are added, no moves are subtracted. For that reason, I am happy for this opportunity to reiterate that the performance of Square Form should look Robotic. In fact, the more robotic the portrayal, the better the performance. The delineation of yin and yang is the eventual goal. That is to teach students what parts of the body to keep still and what parts to move. The part that is still is Yin and the part that moves is Yang. The majority of people who start Tai Chi however, cannot keep much still when it calls for it. 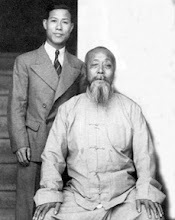 Additionally, that rule to delineate yin and yang is the most important lesson Wu Chien Chuan passed on to Young Wabu. What most often happens is that students by habit move from the individual joints, eg; shoulder. It is difficult to teach students to keep a shoulder still, elbow still, a hip still. The movement at these joints "muddies" the overall quality of movement and in many respects drains off the power that could have been generated had it remained still. Correct Tai Chi thus becomes difficult to teach because the nerve impulses that govern movement from the joints have been cultivated over a lifetime. It is no wonder then that students struggle with the learning, thinking all the wrong reasons for their difficulties. To Paullywalnuts2: Internal Discipline is not "one size fits all"
From Youtube comments on Master Hwa's video "Internal Discipline in Classical Tai Chi"
Discussing the "rationale" of why we do things...examples. Paullywalnuts2: I disagree with both you and dhjmckenzie. Paullywalnuts2 : it is difficult to teach and incorporate internal discipline to students of large frame. Large requires the use of leg muscle to push the body forward and back. Compact Form uses the core to pull the body forward and back. Stretch out and pull back of the arm in large frame, frequent large swings of arms at shoulders requires the use of both shoulder and arm strength. In compact form the upper quarter body movements are entirely internal and directed by the core. dhjmckenzie: Not a one size fit all concept. Internal Discipline works with Compact Form. It does not work for large, forms. "Generating movements " from hips in large frame is different than "generating" Internal Discipline in "Compact" . The hips...are a joint for movement not power. When the hips are used for power instead of the core, the power is drained off. In Large Frame any hip turning is also external. Hip turning puts Yin/Yang junction at knees which makes them subject to "shear" forces. How well this works in large frame is different than how it works in compact frame. Hip turning will not work in compact frame because of such "shear" forces due to the compact stance. Why did we use the examples above, if not to get students thinking and formenting rationales about what they do or do not do. There is a rationale to what we do in in Classical Tai Chi and it is available to both beginner and advanced students at any time. It is like a catalyst agent to enable you to correct yourself. Unfortunately, most students don't know it exists, "I want to just do my Tai Chi and not have to think about it" is the refrain. How to improve then? 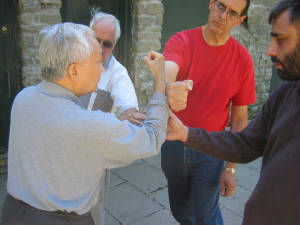 Look at the Youtube video posted just recently in our new Classical Tai Chi Facebook page. Reason how you hope to improve without thinking through what you are doing in Tai Chi. See if you can comment on the obvious inconsistencies to Tai Chi principles in comparison to old masters, then think how are you going to examine what you are doing in your own practice.